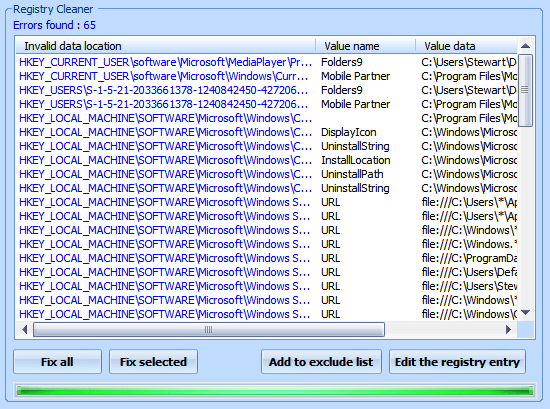 The Windows Registry is meant to serve as a shared storage location for system and application settings. It is essentially a database, has per-user hives, multiple data types, and is generally well-suited for it’s purpose. Lookups (retrieval) of registry values are extremely rapid since the keys are traversed using an optimal data tree (an algorithm for amazingly fast searching). It’s most frequently referenced portions, or even all of it, is usually kept in RAM. First, let us also say that are tens to hundreds of thousands of registry keys containing possibly millions of values. Sounds like a lot, but for computers, its not that much to search through, especially when using an efficient data structure. It doesn’t have to go through each key one by one, for instance. Using a data tree, it can find most any key in a handful of comparisons. Quite often it can jump straight to the key it’s looking for. Thus, when we recently added a new registry key to share between Bitsum apps, we were surprised when users complained that these two new keys were being listed as ‘obsolete’ by registry cleaners. Of course, we explained that these registry cleaners are just guessing, and the truth is that the keys are *not* obsolete, which is why they kept re-appearing after deletion. However, even if those 2 registry keys had been obsolete, it occurred to me how curious it is that some of the less savory actors in the Registry Cleaner industry have so strongly demonized the system registry. Some would prefer you think of the registry as a performance bottleneck, when it *never* is, or as close to never as one can get in the world. Certainly those 2 registry keys won’t have hurt anything, ever.. nor would 2000 keys. Yet, users seemed very concerned. That’s when it occurred to me that I needed to remind consumers about what the registry is, and why it doesn’t matter even f it gets ‘cluttered’, though we were *not* cluttering it up in this case. The truth is that cleaning your registry will never yield any performance improvement, but may cause harm as registry cleaners must guess at what is safe to delete. As for user impulses to keep the registry ‘clean’, honestly it’s more psychological than anything else. If you want to keep it neat and tidy, that’s your prerogative, just don’t expect that to boost performance. All that said, back in the day, there were ways to optimize the registry, which were ironically rarely implemented by the PC optimization industry. This included rebuilding the registry hives from scratch so that their storage is more optimal. However, these days, even this is unnecessary, especially if backed by an SSD, and again hardly any optimization software does this, largely due to the danger inherent in the operation. Note what I describe here is different from simple hard drive defragmentation of the files that back the registry hives. I speak of rebuilding their internal structure by recreating them, which you can imagine can theoretically yield a *marginal* benefit. Yes, even then, it’s a marginal improvement at best. In short, if you want to keep your registry ‘tidy’, by all means do so! Just don’t fall under the misapprehension that doing that cleaning boosts performance, reduces errors, and isn’t inherently dangerous, especially if not done with precision.